The third edition of the French-American Business Awards is set to honor the best blend of French and American businesses. 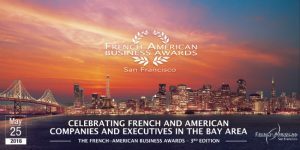 The winners will be chosen from 65 French and American companies, entrepreneurs and executives based in the San Francisco Bay Area in 10 categories including Start-Up of the Year, High Tech with more than $30 million in revenue or funding, High Tech with less than $30 million in revenue and funding and Personality of the Year. Other categories include Agribusiness, Cleantech, Food Business, Wine, US Investment in France and Lifetime Achievement. Nominees are chosen based on excellent annual results and lasting performance in management and leadership. A 120-person jury made of Bay Area business leaders will choose the awards. Laureates will be announced at a dinner on Wednesday, May 25. The FABA are organized by the French-American Chamber of Commerce San Francisco in partnership with Leaders League.